The sickly sweet odor of a dead body is said to be both immediately recognizable and hard to forget. But what chemical cocktail makes up the distinctive odor? And can GC×GC offer investigators a forensic tool that even Sherlock Holmes would envy – the ability to detect the ‘smell of death’? In 2002, Arpad Vass and co-workers published the first study monitoring the volatile organic compounds (VOCs) released by decaying bodies (1), sparking a new field of cadaveric VOC profiling (1)(2)(3)(4)(5). Seven years later, our colleagues at the entomological laboratory at Gembloux Agro BioTech (University of Liège) were examining the behavior of insects as they colonized decomposing pig bodies, which involved analyzing VOC profiles of the body headspace (6). The complexity of the VOC mixture released by the decaying animals meant that the entomologists soon ran into problems. Facing peak capacity issues when using ‘regular’ one-dimensional gas chromatography (1DGC) – even coupled with mass spectrometry - they approached us to help them develop a superior analytical approach. We felt the obvious answer was comprehensive two-dimensional gas chromatography (GC×GC) time-of-flight mass spectrometry (TOFMS), as it would allow us to separate and further identify a greater number of components within the volatile cadaveric signature (7)(8)(9). For us, decomposition VOC monitoring was another perfect example of how GC×GC can make an analytical scientist’s life easier when working with complex matrices, as it had been the case for us previously in our metabolomics and breath analyses projects. At that time, the trial of Casey Anthony had hit the headlines in the United States, so the issue of decomposition VOC profiling was in the spotlight. Anthony was accused of murdering her two-year-old daughter, and the presence of VOCs “consistent with a decomposition event” in the trunk of Anthony’s car was presented as evidence for the prosecution. At the trial, forensic experts were called to testify about the reliability of decomposition odor signatures – in this case, measured by laser-induced breakdown spectroscopy (LIBS). There was intense disagreement between experts, highlighting the need for a more comprehensive description of the decomposition process and its chemical signature. We believed that exhaustive study of cadaveric decomposition by means of GC×GC-TOFMS could help resolve this confusion, thus allowing VOC profiles to be used as evidence in court. Setting out on our quest for a better understanding of the VOCs of human decay, we soon realized that most previous studies were exclusively focused on the forensic aspect of the decomposition process, while neglecting the analytical aspect – unfortunate, given that the analytical challenge is immense! The headspace of a decomposing body contains hundreds of different compounds, from most chemical families, and over a large dynamic range. Moreover, the dynamic nature of the decomposition process itself further complicates the design of VOC signature experiments. Thus, our first goal was to optimize our GC×GC-TOFMS method to perform non-targeted screening of the decaying pig headspace at various stages of decomposition. In doing so, we came up against the same challenges as GC×GC users in any other field: how do we sample and introduce analytes into the system? How do we optimize peak dispersion into the 2D space? How do we process replicate chromatograms? How do we deal with the large amount of corresponding data? Which statistical methods are compatible? All these questions are still common to all studies in the field of GC×GC – and remain hot topics at symposia like the forthcoming ISCC & GCxGC (www.isccgcxgc.com). First, we tested three different sampling techniques: solid phase micro-extraction (SPME), solvent extraction, and thermal desorption (TD). TD soon emerged as the most effective method for trapping cadaveric VOCs (10). TD also has the advantage of preserving sample integrity during sampling (tube loading) in body farms, storage, and shipment of tubes to the analytical laboratory. Furthermore, with dynamic sampling and solvent-free extraction, TD allows a representative trapping of the decomposition headspace. In our first few studies, we carried out chromatographic separation using a classic non-polar × semi-polar column combination, with 5 percent phenyl siloxane as 1D and a 50 percent as 2D (8). We later evaluated many other different phase combinations, such as semi-polar × non-polar, and ionic liquid × non-polar. Ultimately, the most appropriate phase combination came from our collaborators at the Forbes lab in Australia (11), who reported a combination of a cyanopropyle phase (Rxi-624 SilMS, Restek) and a polyethylene glycol phase (Stabilwax, Restek) for the efficient separation of semi polar compounds in complex VOC matrices (for example, cadaveric decomposition and cell culture headspace). Figure 1. 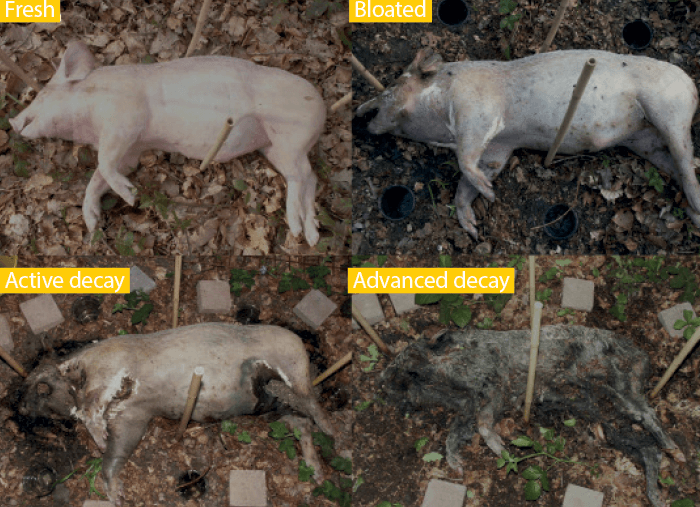 Typical decay stages followed by the pig carcass in a forest biotope. From (8). Much of our time in those early studies was dedicated to data handling. The first report we published in 2012 involved days of manual data sorting in Excel spreadsheets before any statistical work could begin – all very well for a proof-of-concept study, but not realistic for the large number of samples needed for forensic investigations. The implementation and use of commercially available alignment tools, such as “Statistical Compare” in ChromaTOF (LECO Corp.) and GC Image package (Zoex Corp.), made our lives much easier. However, simply feeding raw data into the software won’t get the job done. One of the main problems was separating the relevant information from artefact signals and analytical noise. When your sample alignment generates almost 1,000 hits, you know that many of them will not be significant. Based on work by the Synovec group (12)(13), we decided to use a Fisher ratio (FR)-based approach to reduce the size of our data matrix. But where should we set the cutoff to concentrate our statistical treatments on the most significant features? We evaluated a number of different approaches, but settled on the use of F critical values. These values are defined by the degree of confidence we want to apply (for example, 99 percent or 95 percent) and the two degrees of freedom of our analysis (the number of classes and the number of replicates in each classes) (14)(15)(16). All compounds with a FR value above such F critical values were defined as statistically significant. The method cuts the number of features by 10–20 percent, allowing us to focus only on the most significant compounds for statistical treatment (14)(15)(16)(17). Determining an accurate fingerprint for the smell of death may prove invaluable for the recovery of bodies in disaster areas – but what of survivors buried under debris? Currently, rescuers use highly trained dogs to locate trapped survivors – a dog’s nose is a highly accurate VOC detector, and search and rescue dogs have an excellent success rate. However, dogs take a long time to train, can work only for short periods, and cannot be used in highly dangerous environments. Several groups have explored alternative routes for detecting the ‘smell of life’, using a range of technologies (C-MS, PTR-MS, SIFT-MS, MCC-IMS, FAIMS and sensor-based systems). 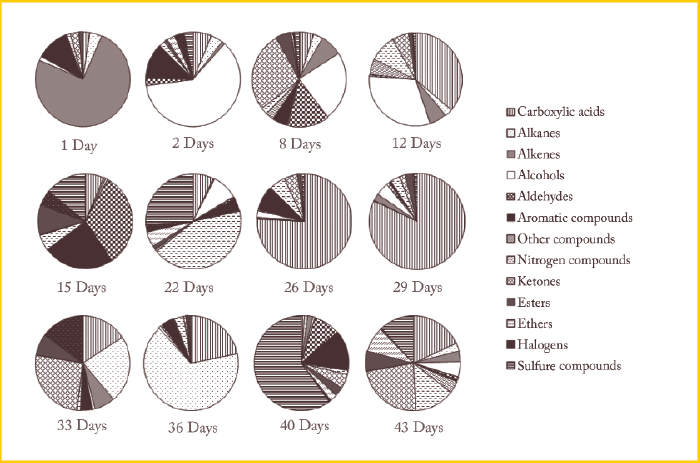 Figure 1 shows the composition of volatile organic compounds (VOCs) released by living human bodies. A group from Austria classified these compounds, and identified 11 VOCs consistently released in detectable quantities – CO2, ammonia, acetone, 6-methyl-5-hepten-2-one, isoprene, n-propanal, n-hexanal, n-heptanal, n-octanal, n-nonanal, and acetaldehyde. This information may help scientists find new ways to sniff out disaster survivors, and so relieve the burden on canine search and rescue teams. P Mochalskia et al., “Potential of volatile organic compounds as markers of entrapped humans for use in urban search-and-rescue operations”, TrAC, 68, 88–106 (2015). Multivariate statistical methods (for example, principal component analysis, clustering, partial least squares) are increasingly used to handle data sets issued from GC×GC analyses (18)(19). In fact, multivariate statistics have been used and reported in almost every GC×GC paper for the last three years. However, we question the utility of these mathematical treatments. As we see it, one of the important points of concern is data dimensionality. The vast majority of mathematical models used in GC×GC are based on a classical data dimensionality, so that there are three to five times as many replicates (n) as the number of variables (p). Before you apply methods such as PCA, you have to be sure of a good n/p ratio, or risk overfitting of the data (20). The F critical approach allows us to reduce data dimensionality, with a focus on the most informative variables (12)(13). And that’s why we believe that this approach will benefit GC×GC users. Over time, we adopted newer technologies, transposing our approach to GC×GC coupled to high-resolution time-of-flight mass spectrometry (HRTOFMS). HRTOFMS offers mass accuracy below 1 ppm while maintaining signal deconvolution capability, and can be seen as an extra dimension for compound identification. However, this enhanced system dimensionality makes data management even more complex and current data processing tools suffer from significant limitations. GC×GC-HRTOFMS profile data files are large and unwieldy, especially when considering replicate analyses of several sample classes for statistical comparisons. For now, our approach is to first perform all data analyses from GC×GC-LRTOFMS, including data acquisition, data alignment, data reduction, and statistical treatment up to isolation of features of interest. Next, we produce GC×GC-HRTOFMS data exclusively focusing on specific features for proper identification using two dimensional retention time (1tR and 2tR), linear retention time (LRIs), MS fragmentation screening in MS libraries, and accurate mass data for molecular formulae elucidation. GC×GC, especially coupled to TOFMS, has now become the most applied method for cadaveric decomposition profiling. It is no longer necessary to demonstrate what GC×GC can do; instead, it is time for a full validation of the technique, not just for the characterization of parameters that influence the decomposition process, but also for routine applications and evidence in court (11)(21). There is no doubt that the additional information provided by GC×GC will lead to major advances in our understanding of cadaveric decomposition chemistry. GC×GC-TOFMS instruments are now being installed in analytical laboratories of taphonomy facilities (such as body farms), to be used for large-scale studies on the decomposition of human remains, which will enrich current databases and provide the robustness that has been missing in cadaveric VOC profiles presented in the courtroom. For the immediate future, we will focus on implementing a quantitative approach for analysis of decomposition VOCs. To date, only semi-quantification has been performed, and a full quantification of biomarker candidates will lead us to a closer understanding of the decomposition process. In addition to the headspace of dead bodies, we are also chasing these cadaveric VOCs in a broad range of matrices, including (suspected) grave soils, human tissues, and internal cavity gases. Each matrix creates a new analytical challenge in terms of method development and brings new investigative angles to the quest for sample characterization. Our internal gas reservoirs project (testing the small pockets of gas inside cadavers) is a collaboration with the Center of Legal Medicine at the University of Lausanne. Laser-assisted post-mortem computed tomography is used to locate gas bubbles, and samples are taken using gas syringes (22). We then scrutinize the internal gas samples by GC×GC-HRTOFMS to complement the gas measurements performed in Lausanne with our VOC profiles. Preliminary results suggest that not all organs decompose at the same speed, a finding that may help pathologists understand causes of death and make more accurate post-mortem interval calculations (23). We corroborated these findings with further studies on organ-specific VOC production, in which various human tissues were left to decompose in a controlled environment. These tissue-based experiments have the major advantage of allowing for many more replicate experiments than when using a body farm, where one is always limited by the number of bodies available, and gets us closer to the good n/p ratio we noted earlier as being so important. The Return of Sherlock Holmes, A Conan Doyle (1903). The profiling of VOCs released by cadavers is a continuously growing field. State-of-the-art technologies are allowing us to analyze new kinds of matrices, which opens the door to potential medico–legal applications. Moreover, a comprehensive understanding of tissue degradation chemistry will lead to improved training programs not only for cadaver dogs, but also their counterparts in search and rescue. By pinning down the differences in VOC profile between an injured person and a ‘fresh’ cadaver, we may be able to improve the efficiency of search and rescue dogs in locating survivors after a mass disaster event. It is these valuable field applications that motivate us to continue to challenge the analytical technology to its extreme.